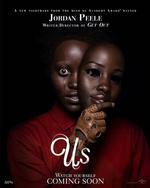 After sending shockwaves across contemporary culture and setting a new standard for provocative, socially-conscious horror films with his directorial debut, Get Out, Academy Award®-winning visionary Jordan Peele returns with another original nightmare that he has written, directed and produced. Set in present day along the iconic Northern California coastline, Us, from Monkeypaw Productions, stars Oscar® winner Lupita Nyong’o as Adelaide Wilson, a woman returning to her beachside childhood home with her husband, Gabe (Black Panther’s Winston Duke), and their two children (Shahadi Wright Joseph, Evan Alex) for an idyllic summer getaway. Haunted by an unexplainable and unresolved trauma from her past and compounded by a string of eerie coincidences, Adelaide feels her paranoia elevate to high-alert as she grows increasingly certain that something bad is going to befall her family. After spending a tense beach day with their friends, the Tylers (Emmy winner Elisabeth Moss, Tim Heidecker, Cali Sheldon, Noelle Sheldon), Adelaide and her family return to their vacation home. When darkness falls, the Wilsons discover the silhouette of four figures holding hands as they stand in the driveway. Us pits an endearing American family against a terrifying and uncanny opponent: doppelgängers of themselves. "Like “The Shining,” there are a number of different ways to interpret Jordan Peele’s excellent new horror movie, Us. Every image seems to be a clue for what’s about to happen or a stand-in for something outside the main story of a family in danger. Peele’s film, which he directed, wrote and produced, will likely reward audiences on multiple viewings, each visit revealing a new secret, showing you something you missed before in a new light. " "A brilliant home-invasion thriller laced with cultural reference points stretching back to the late ’80s, and a smorgasbord of first-rate visceral cinematic scares. Think “Funny Games” collided with Cronenbergian body horror and Hitchockian suspense, and you’re maybe halfway there." "Once again, the director draws upon the sketch-comedy gifts he honed on “Key & Peele” to achieve an artful, ruthless balance of horror and hilarity. Us is a tour de force of comic tension and visceral release, a movie that weaponizes our chuckles against us and reminds us that laughing, screaming and thinking are not mutually exclusive pleasures."